Happy Thursday! 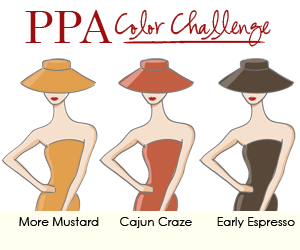 I loved this challenge because the colors are fall. But, it's still very warm here in California (coming off triple digits in some places) and so I stayed away from the fall "leaves" with my flowers above. I began my card with a Cajun Craze base, which I cropped a bit smaller than the typical 5-1/4" wide so I could have my Round Designer Ribbon Slide right at the edge, a bit of (retired) Early Espresso 3/8" Quilted Satin ribbon past the edge, but still have my card fit into the Medium Envelope. My next layer was a More Mustard, Chevron-embossed piece of card stock. I stamped the Early Espresso stem and leaves from Fabulous Florets onto Very Vanilla card stock. On the left edge, I added an Early Espresso edge punched with the Dotted Scallop Ribbon Border punch. On top of the stems and leaves, I added two More Mustard florets, stamped in Early Espresso and Cajun Craze inks. I snipped them out with Paper Snips and added one popped up 1/2" circle from Very Vanilla. Lastly, I added my birthday sentiment from Create A Cupcake, stamped onto the Very Vanilla with Cajun Craze ink. I hope you are inspired by my creation and all the Design Team creations at Pals Paper Arts. Won't you play along? 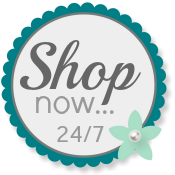 For any of your Stampin' Up! products, please use my Website to order. Love these flowers all done up in fall colors! so crisp and pretty. love the ribbon slide . . . i need to get those guys back out! i forget i have them. Those florets are Fabulous alright. I love the chevron background! Patti what a pretty card. I'm loving these colors and hope to play this week. It's funny how you can almost tell where the DT members live by the 'theme' in their fall cards. Too funny. hugs. Gorgeous, Patti! I love the center of the one flower. It just "pops" off the page! The ribbon with the slide is a perfect accent! This is so clean and crisp. Love all the white space. Who says you need to load a card up to have impact! Amazing!